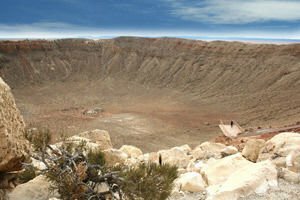 Barringer Crater is the best preserved and largest known meteor crater on Earth. Similarly, to the large craters on our planet that can be seen in Mexico, Antarctica, Australia and Siberia, but the crater Barringer is a favorite among them. It is located in the middle of the Arizona desert Healy, formed in the U.S. state of Arizona. Barringer Crater is named in honor of its discoverer - geologist and mining engineer Daniel Barringer in 1871, most probably the hole in the middle of the desert was formed about 50, 000 years ago, during the Pleistocene by the fall of a iron-nickel meteorite with a diameter of about 50 meters. Currently Barringer has a diameter of 1264 meters, has a depth of 180 meters, and the edge is 45 meters high - dimensions that put it first among all other similar craters. Barringer Crater was opened in 1871. For a significant amount of time people and scientists have considered it to be an extinct volcano cone. Only in 1903 the geologist and mining engineer Daniel Barringer expresses the hypothesis that this has nothing to do with volcanic activity and most likely is a crater caused by a collision with a meteorite. What makes Barringer sure is simple – he just proves that the huge rocks around the pit are not of volcanic origin. The scientist decided to buy the land around the crater, looking for evidence, but, alas, he never found pieces of the meteorite. His hypothesis remains unconfirmed fully until 1960. The reason for this lies in the fact that after striking the ground boulder was splattered into countless small pieces. Scientists say the meteorite fell at a speed of 72, 000 km / h and at impact it has exploded with a force thousands of times greater than that of the nuclear bomb on Hiroshima. The explosion dispersed around 5-6 million tons of rock and dust into the sky. Residue of the 300, 000 ton meteorite was found within a radius of 10 km. To this day the land is owned by the family Barringer. Bottom of Barringer Crater strikingly resembles the lunar surface, which is why in the 60's of last century it was used for training of U.S. astronauts. Today crater Barringer has become a tourist attraction and the visitors' center is located on the southern edge of the crater. The bottom is reached along a steep path. In 1964 the crater bears witness to a plane crash, and fragments of the crash can still be seen today in the same place, where they have fallen nearly 50 years ago.